President Barack Obama and Republican candidate Mitt Romney had one thing in common in their convention speeches: They both mentioned epic entrepreneur Steve Jobs. 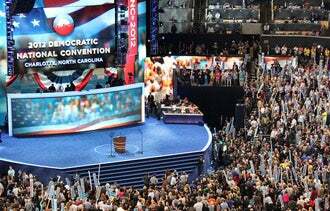 Overall, however, the Democratic National Convention was more focused on supporting middle-class workers while the GOP's event was more centered on promoting private-sector businesses. The way the two candidates talked about the late Jobs is illustrative of how they address entrepreneurship in their campaigns. In his nominee acceptance speech, Romney spoke about the Apple Inc. co-founder to spotlight the risks and struggles involved in business, explaining how Jobs was fired before he returned to the company "and changed the world." Meanwhile, Obama mentioned Steve Jobs as he spoke about the nation's responsibility to take care of its citizens, especially the less fortunate -- a dominant theme in Thursday's address in Charlotte, N.C.
"We believe the little girl who's offered an escape from poverty by a great teacher or a grant for college could become the next Steve Jobs or the scientist who cures cancer or the President of the United States, and it is in our power to give her that chance," said Obama to a cheering crowd. Earlier in his speech, the President acknowledged the value of entrepreneurs: "We honor the strivers, the dreamers, the risk-takers, the entrepreneurs who have always been the driving force behind our free enterprise system, the greatest engine of growth and prosperity that the world's ever known." Obama counterbalanced the statement by stressing that entrepreneurship, while part of a successful economy, goes hand-in-hand with the responsibility to nurture those with fewer opportunities. "We believe that when a CEO pays his autoworkers enough to buy the cars that they build, the whole company does better," Obama said. To be sure, both parties want to have small businesses on their side, but their pitches come from opposite ideological standpoints. Republicans champion the notion that with government as much out of the way as possible (low taxes, no regulation), those who work hard will prosper and stimulate the rest of the economy. Democrats pitch small businesses by saying government ought to protect and support them, thereby stimulating the economy because small-business owners are job creators. Earlier in the week First Lady Michelle Obama and former President Bill Clinton gave popular speeches defending the President's record, stressing that the President inherited an economic mess four years ago and distinguishing the Democratic platform from the Republican's. As Clinton put it Wednesday night: "We believe that 'we're all in this together' is a far better philosophy than 'you're on your own.'" While the DNC did not focus on entrepreneurship the way the RNC had, a number of entrepreneurs and industry advocates spoke during the convention. Their stories were about how the government had supported or saved their business. For example, Bill Butcher, the founder of Port City Brewing Co. in Alexandria, Va., spoke Wednesday about how he wasn't able to get a bank loan without help from the Small Business Administration. "There were moments when my wife Karen and I wondered if we would ever get our business off the ground," he said. "I remember what it was like to go to bank after bank after bank hearing 'No.'" The chief of the SBA, Karen Mills, touted the President's support for small business, from implementing tax cuts to requiring that federal contractors pay in 15, not 30, days. "He understands that Washington doesn't create jobs; small businesses do. Government's role is to put the wind at their backs," said Mills in a speech Wednesday. "And after the worst economic storm in generations, that's exactly what President Obama is doing--expanding access and opportunity in every corner of all 50 states." At last week's convention, Republicans used the expression "We Built It" -- a dig against Obama's "You didn't build that" comment -- to highlight how individuals are responsible for small-business success. In contrast, Democrats often spoke of how government plays a critical role in aiding entrepreneurs. In her speech, Mills mentioned Raleigh Denim, a blue-jean manufacturer headquartered in North Carolina, which now exports jeans to eight countries on three continents. Husband-and-wife team Sarah and Victor Lytvinenko started with a couple of old sewing machines, and now employ more than a dozen workers. The company, Mills noted, has received multiple SBA-backed loans over the years -- proof that growth happens thanks to a partnership with the government. 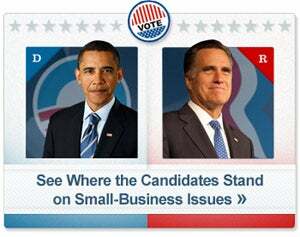 Do you feel like the concerns of small-business owners were addressed at one convention better than the other? Leave a comment below and let us know.